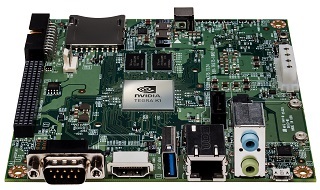 The NVIDIA Jetson TK1 development kit is a full-featured platform for Tegra K1 embedded applications. It allows you to unleash the power of 192 CUDA cores to develop solutions in computer vision, robotics, medicine, security, and automotive.. Enables 3rd party network adapters and other devices to directly read and write CUDA host and device memory on NVIDIA Tesla™ and Quadro™ products. GPUDirect technology also includes direct transfers between GPUs. The open source compiler infrastructure on which NVIDIA's CUDA Compiler (NVCC) is based on. Developers can create or extend programming languages with support for GPU acceleration using the CUDA Compiler SDK. MPI is the industry standard API to enable applications threads to communicate across compute nodes. The latest implementations of this technology now support GPU accelerated nodes. Have a problem with your application or want to share some tips? Try posting on the CUDA Developer forums and benefit from the collective wisdom of thousands of GPU developers.